The Bed and Breakfast Villa Valentina is an elegant resort in a villa among orange and lemon trees located in Trappitello, in the Municipality of Taormina. Equipped with large open spaces, is furnished with sobriety including the wi-fi coverage throughout the garden. This will allow you to spend quiet and relaxing moments. The entrance is along a private drive lined with vegetation and at the end of it there is private parking for guests. From parking is possible to see Castelmola and a part of Taormina. From here you arrive at the rooms. Each rooms of B&B Villa Valentina have an independent entrance. The rooms are reacheable along a path between oranges and lemons. Between Bed and Breakfast in Taormina the Villa Valentina is located at the gates of the Alcantara River Park. Close to the most fascinating beaches of Eastern Sicily by the cobalt blue sea and from it you can reach even the Alcantara Gorges and Mount Etna. 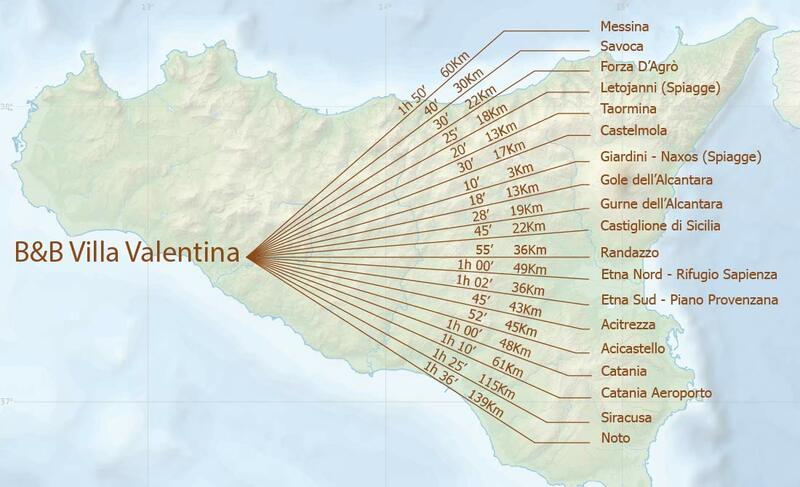 Taormina is 7Km from the B & B and can easily be reached via Giardini-Naxos. From the garden of the B & B we can admire Mount Etna, reachable in just over an hour, and the Castle of San Filippo reachable in 10min. To the north we can see Castelmola resting on a rocky spur. Come and visit us, we will help you live and fully discover the nature and the beauties of our places that we know well. With maps and detailed information, you can organize your tourist itineraries with unique and original places. From the excursion in the mountains to the boat trip, from the enogastronomic path to the historical one. Welcoming and functional, they have been designed in every small detail to be able to meet the needs of travelers. USB charge, electric kettle, mini fridge and everything you need to spend your stay in the best way. Rich and varied, it will satisfy your needs. From sweet to savory, breakfast will almost always be accompanied by orange juices from our orange grove. Served as a buffet in the breakfast room, you can enjoy it indoors or in the garden. Appreciable from every single room, in it you will find orange trees and various fruits that will tempt you with their colors and smells. In the large lawn that extends frontally to the rooms it is possible to relax immersed in nature. Il B&B Villa Valentina is positionated on the crossroad of the 3 main way of Eastern Sicily that allow you to reach the most important touristic and naturalistic site.Taormina, Etna, Giardini Naxos e le Gole dell'Alcantara are only a part that. At B&B Villa Valentina in Taormina the policy is customer satisfaction. All this has been recognized by our guests who wanted to share their experiences on Tripadvisor.